While ironically resembling a hybrid of Fort Boyard and Cube at times, "Heaven Sent" was a magnificent hour of sci-fi and easily the best episode of Doctor Who this year. 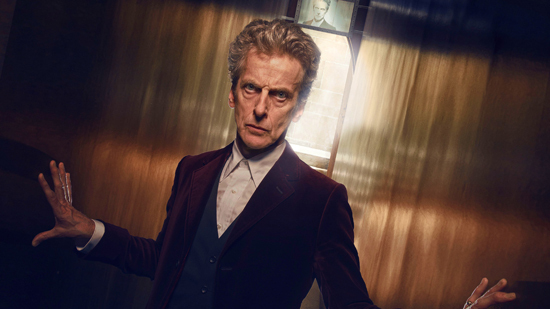 I'd rate it within the best three Peter Capaldi era hours, too—thanks mainly to something the show doesn't always deliver: a good, robust ending. After being teleported off-world by Ashildr last week, after handing over his confessional dial, The Doctor (Capaldi) found himself transported to a bizarre structure resembling a mediavel castle—one that belied its alien origin thanks to flatscreen televisions, and a worrying tendency to change geometry for added confusion. Adding to The Doctor's dilemma, he was being stalked by an entity known as The Veil (Jami Reid-Quarrell)—lifted from one of his recurring nightmares, born from a memory of a decomposing woman in a burial gown whose corpse attracted flies. 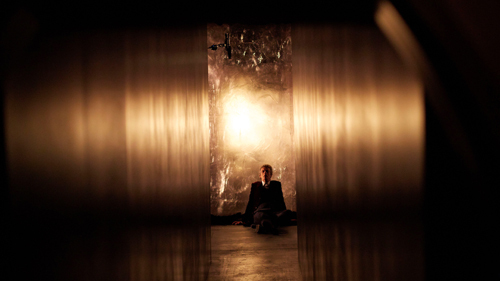 The crux of this episode was beautifully simple: can The Doctor's immense intelligence crack a whole series of questions to explain his whereabouts, and what's being asked of him? 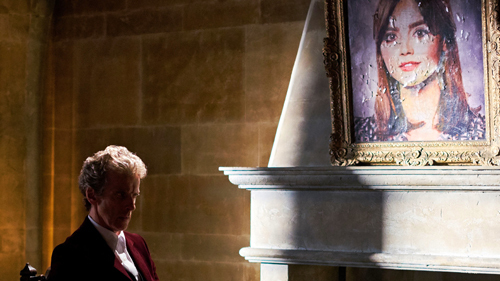 And can he win without the help of deceased companion Clara, whose interjections and advice he instead has to imagine during crisis moments when he pretends he's inside his TARDIS and Clara's scribbling questions on a chalkboard for him to answer in the nanoseconds before a life-or-death moment. It was all very well put together and a natural showcase for Capaldi's Doctor—who was essentially asked to perform a one-man mystery-show (with another brief peek through the fourth wall, which seems to be a recurring motif for Twelve). Thankfully, both writer Steven Moffat and Capaldi were up to the enormous challenge of crafting a compelling mystery in a "single location" (broadly speaking) with only one person's self-narration to lean on. Director Rachel Talalay (returning from finale duties last series) also managed to bring the whole episode to life, when it could have become stultifying in less skilled hands. However, the best thing about "Heaven Sent" was how much of it came together in the end. I sometimes underestimate Moffat these days, because his workload's such that he's guilty of writing ambitious episodes that don't really hang together very well—which is when he'll usually claim, very publicly, that the show works to children's logic and it's only the adult viewers who have a problem understanding things. That's a defence of his I don't really accept, because Doctor Who has delivered some astonishingly nonsensical episodes that—thanks to half-clever, fast-paced writing—can create the illusion of being complex and too clever by half. "Heaven Sent" had some moments where I was steeling myself for another ludicrous ending, and I had at least four question marks handing over various things… but, by the end, I was surprised how much of this worked. It was a definite stroke of genius to reveal that The Doctor had actually been trapped inside his own confession disc, and that the enormous shape-changing castle was contained within such a small space (signature Time Lord technology). It appears he had been transported off-world, but to Gallifrey—where I presume the Time Lords used this trickery to interrogate him about the fabled Hybrid creature (last mentioned in the premiere). I also loved how The Doctor managed to escape the castle to begin with, as he realised the entire situation could be ended by a "time loop", of sorts—relying on him dying to generate a copy of himself, who would begat another copy after another several thousand years of trial-and-error to evade the Veil creature and punch his way through a tough 20ft Azbantium wall to freedom. A process that took over a billion years, all told, meaning countless copies of The Doctor perished to eventually triumph—symbolised by a seabed of the Doctor's skulls, which always end up toppling into the water. All very clever, quite logical, and interestingly put together and dramatised. I still don't quite understand what the Hybrid is, or means (as it's been a hazy aspect of Series 9 I'm sure casual viewers had long forgotten about), but hopefully the finale will answer all our questions. But why is The Doctor now saying he's the Hybrid? In the sense he's a Time Lord but is so strongly affiliated with humanity? The Veil was played by Jami Reid-Quarrell, who was also Colony Sarff in the premiere two-parter. As I said, one of this episode's strengths was how logical it all felt, but I did have one nitpicks: why didn't the Azbantium wall 'reset' along with everything else? I didn't think we'd seen the end of Jenna Coleman on the show, but her brief appearances throughout this hour were handled well. It didn't seem like a cheat to bring Clara back (she was just imaginary), and seeing her didn't undermine the impact of her death last week. Still, it was a shame the gimmick of having an episode only starring The Doctor wasn't technically achieved.